Sous vide is French for "under vacuum". In the US the term "Cryovacked" is often used instead of Sous vide. It is a technique where the ingredients are put in a vacuum-sealed plastic pouch, usually for a long time and cooked at a low temperature (usually around 60°C = 140°F). In some cases food is cooked for 24 hours or more. Although many excellent dishes can be prepared in under 30 minutes. The technique is currently being used by many of our top chefs including: Thomas Keller, Paul Bocuse, Joël Robuchon, Charlie Trotter, Wylie Dufresne Heston Blumenthal. 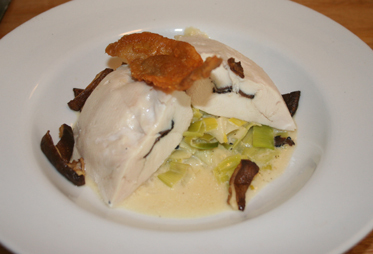 Recently we have begun to see Sous vide cooking being adapted into the home kitchen (See below). The method was developed by Georges Pralus in the mid-1970s for the Restaurant Troisgros (of Pierre and Michel Troigros) in Roanne, France who was looking for a new way to to cook foie gras, which shed 30 to 50 percent of its original weight in cooking. Pralus found that when cooking foie gras using Sous Vide techniques its original appearance did not lose excess amounts of fat and had better texture. Bruno Goussault was working along the same lines in the 1970's, but instead at an industrial level. In 1974, Goussault worked on a study that was presented on the sous vide cooking of beef shoulder at an international frozen-foods conference in Strasbourg, France. It was found that cooking the beef sous vide extended its shelf life to 60 days. Sous vide cooking time is affected by three factors: (1) the core temperature you wish to cook the dish to; (2) the heat transfer characteristics of the food; and (3) how much food will be cooked at one time. For example, meats – which do not conduct heat particularly well – will require longer cooking times than foods such as vegetables which are much less dense and offer greater relative surface areas. Also, the greater the cooking liquid to food ratio, the faster each portion of food will reach the proper core temperature. PolyScience a leader in sous vide cooking recommends that when cooking sous vide, that the cooking pouches be completely covered with liquid and that there is sufficient room for the pouches and cooking liquid to circulate freely. Most professional cooking relies on a cook's ability to judge doneness based on sight and feel. 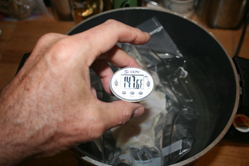 With sous vide, it is all about precise times and temperatures. In sous vide cooking once the proper temperature and time is determined restaurants are able to reproduce taste and texture fairly easy. The ‘art’ of sous vide cooking is in determining the perfect ‘core’ temperature you need to reach to achieve the desired taste and texture. Professional sous vide chefs use a thin hypodermic needle thermometer, inserted through a piece of spongy self-sealing tape, to test the internal temperature of the vacuum-packed foods without breaking the package's vacuum seal. Meats are usually seared before serving, which not only crisps the food, but kills any surface bacteria. Maintaining a slow cooker or pan of simmering water at just the right temperature is a very time-consuming, hands-on process. Also, because they don’t circulate the cooking liquid, these devices can develop hot and cool zones that adversely affect the cooking process.Restaurants require professional equipment for sous vide cooking that will maintain temperature without constant adjustments. Cuisinetechnology by Polyscience is a leader in the field with a long list of top chefs as clients (Thomas Keller, Paul Bocuse, Joël Robuchon, Charlie Trotter, Wylie Dufresne Heston Blumenthal). 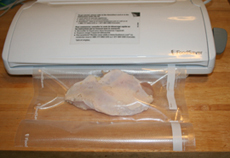 Presently there are several vacuum packers available on the market that are being used by home chefs. We have found sufficient success with the Food Saver Line (see photo above). Maintaining a low and constant temperature however can be a problem for the home cook. The most available approach would simply be using a stove top water immersed system monitored with a thermometer. Either adjust the flame or adding hot or cold water has been shown by many to work well. However this method requires constant watching. In cooking trials done for this site an old deep fryer was found to hold the temperature to within 1.5 degrees over a period of 30 minutes. Hot or cold zones were not detected surrounding the plastic bag. This suggests that the heating element located only at the bottom of the deep fryer provided sufficient convection currents. It was also found that using large amounts of water ensured minimal temperature fluctuations. Adjustments were easily made by adding small amounts of ice or hot water. Another problem the home chef will face is not having a means to measure internal temperatures of the food medium. Without rather expensive equipment, internal temperatures cannot accurateley be determined until after the cooking process is complete. However, through trial and error methods we can determine approximate time internal temperature is reached and then continue the cooking process for longer times as determined by the Safety Tables shown below (See Safety Issues below). A good rule of thumb would be to start with an extended cooking time and work back. --Food can be seasoned and packed with small amounts of oil, butter or stock that would normally be required in large amounts when poaching foods. The rule of thumb among food service professionals is that foods should stay in the so-called "danger zone" (temperature range of 40F to 140F degrees) as briefly as possible since bacteria thrive in that range. However much of sous vide cooking occurs at lower temperatures and even cooking at 140F can be dangerous if one is not familiar with the various D-values for microbes. D-value refers to decimal reduction time - The time required at a certain temperature to kill 90% (or 1 log10) of the organisms being studied. Thermal inactivation of Salmonella requires a value of 7-D ( 7 log10) and a 12-D reduction is required of C. botulinum in canning. D-values can be depend on pH and salt concentrations as well as fat content in food. The two tables below give the 7-log10 lethality for Salmonella at two different fat contents. The tables clearly show the extended times required for cooking at low temperatures. Keep in mind these are cooking times required once the thickest portion reaches it's target. Salmonella spp. are not particularly heat resistant and most serotypes are killed by normal cooking conditions (see above tables). However, a few highly heat resistant serotypes have been reported. Because the majority of bacteria that cause food-borne illness are found on the exterior of food, searing meat surfaces before serving will reduce the number of microbes on the surface. Chilled vacuum-packaged food must be kept very cold - below 4°C - and cooking should be at temperatures above 60°C, to keep food out of the "danger zone." Once cooked, foods need to be served immediately or chilled in quickly in an ice water bath. If vacuumed foods (which contain an anaerobic environment) contain C.botulism spores they could germinate and produce dangerous toxins. See: The The Problems with Cooling Food.